Wild Willpower began compiling this website following the release of attack dogs and the destruction of the Lakota/Dakota/Nakota ancestral burial sites on September 3rd, 2016. This site and the behind-the-scenes casework will be finished shortly. The content throughout this site does not necessarily reflect the political views of any organization or individual mentioned throughout this website. This site is being built into a publicly-accessible, user-friendly archive, logistical analysis, & “Redress of Grievances” which takes into consideration the historic and cultural context of the circumstances & people involved, the civil rights violations against Water Protectors, the illegally approved Dakota Access Pipeline Project (“DAPL”), as well as other factors. All content throughout this page is being presented by Wild Willpower, without prejudice, for First Amendment purposes while in alignment with the Constitution’s charter, The Preamble; the use of all such content is protected with regard to the Fair Use Index of the U.S. Copyright Office – see Fair Use laws for details. Excessive Force, False Imprisonment, etc. Water & Land Rights – coming soon, behind-the-scenes compiling underway! Other lawsuits will be placed here asap. Website in making. This section will be finished soon, & contains a “List of Reasonable Demands” that will provide people with the opportunity to sign so we can get the class actions moved forward. Some of the “demands” can be found embedded among our platform, which has been adjusted since the time of our arrival at Standing Rock. Please check back with this website & our other websites, as we’re preparing them daily to move the upcoming case forward. In addition, there is a great deal of legal information being brought together on www.ReUniteTheStates.org, as we are concerned with not only adhering to legal procedure, but also we are concerned with “leaving a trail” to help others learn how to build & file civil actions. 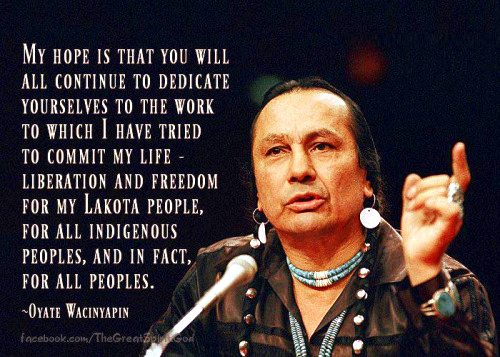 Russell Means quote uploaded to Pinterest used in accordance with Fair Use.